In late April the Tokyo Metropolitan Government announced a plan to establish 400 kilometres of recommended bicycle routes around the city before the 2020 Olympic Games in Tokyo. Targeting 7 areas the plan aims to provide a continuous network of safe cycling routes, but there have been little details forthcoming as to what from these "safe cycling routes" will take. Surprising to many is the fact that the Tokyo Metropolitan Government regulates just 2,000 km of roads in the capital with the remaining 20,000 km being regulated by municipal governments such as wards, cities and towns. In the past this has hampered the development of continuous linked bicycle routes as there has traditionally been little co-ordination between the responsible parties. 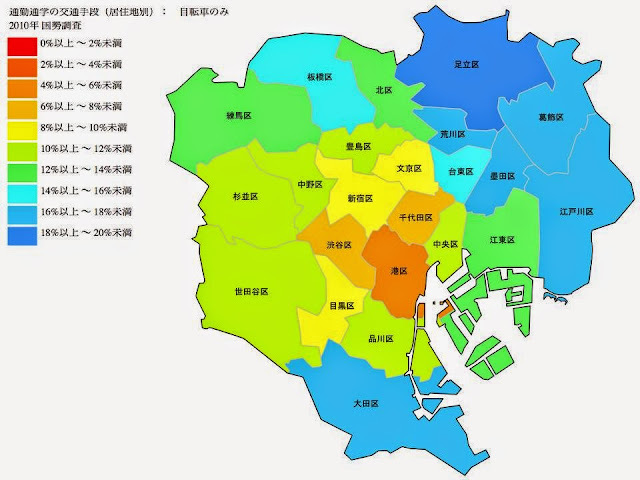 A central part of the plan announced last month was that the National Government, Tokyo Metropolitan Government and Local Governments would work together to establish a network that effectively ignores political boundaries and provides continuous service to cyclists. But given the perceived lack of space that planners lament when discussing the proposed implementation of separated cycling lanes it is likely that Tokyo's "safe cycling routes" will be nothing more than a combination of 1 meter wide painted roadside lanes, sharrows (which are little more than direction indicators), and shared pedestrian and cycling paths (otherwise known as sidewalks). We must remember that this is a plan for "safe cycling routes" not a blueprint for protected bicycle lanes. In short, it's a rather disappointing effort. Also disappointing is that this plan is focused entirely around the Olympics and offers very little value to the residents of Tokyo who, we must not forget, will ultimately be footing the bill. 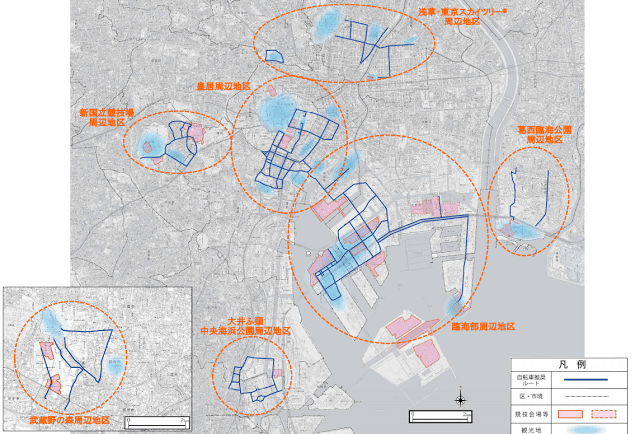 The plan targets 7 areas surrounding Olympic venues and major tourist areas including Asakusa and the Tokyo Sky Tree, completely ignoring major stations, business and shopping districts, around the city ultimately limiting the networks usefulness to a short period while the Olympics are actually taking place. It is overly obvious that little research has gone into creating a cycling network for the city. Nobody was out on the streets counting cyclist, mapping dangerous areas, or surveying cyclists needs. Research, that our Olympic planners have chose to ignore, shows that central areas of the city, the areas of these proposed safe cycling routes, have much lower cyclist numbers than surrounding areas and that pouring millions into infrastructure in these areas totally ignores the areas that could benefit from safe cycling infrastructure. Tokyo taxpayers should not stand for this inappropriate us of their money. Cycling modal share by ward, shows that peripheral wards cycle more. Outlying wards is where cycling infrastructure us needed. Some may say "build it and they will come", but I would prefer cycling infrastructure is built where there is a need first. Sadly this is purely a plan for the sake of the Olympics, completely detached from the reality of cycling in the city, and for that it is worthy of absolutely no praise at all. The Olympics have given cycling advocates in Japan a unique opportunity to have cycling discussed at high levels of government, unfortunately it seems that those in positions of power can not see beyond the Olympics. They have no knowledge of the great benefits, financial, health and environmental that cycling can bring not only cyclists, but to the city itself, they're blinkered by the very event that put cycling on their radar. As a cycling advocate I've put great effort into increasing public awareness about the benefits of cycling, and have worked hard to increase cyclist numbers in Tokyo, but in Japan where the majority of the public already understand the benefits and importance of the bicycle as a part of everyday transport I now realise that my efforts have been misguided. What Japan really needs is for cycling advocates to focus on educating politicians, officials, and those in positions able to affect change as to the benefits of everyday cycling so they can make informed decisions for the future. Many decision makers see cycling infrastructure as little more than a frivolous waste of money catering for a fringe group whereas research from the Netherlands and Denmark concludes that a small investment in cycling infrastructure more than pays for itself by promoting healthy lifestyles that reduce a populations dependence on health care, increases worker productivity, and even results in a lower number of sick days taken by employees. Each person on a bicycle is not only saving the city money, but contributing to the local economy by shopping close to home. Each person on a bicycle is reducing the cities total greenhouse gas footprint. Each person on a bicycle is reducing congestion on our roads, and public transportation network. Each person on a bicycle is an important part of the community which they travel through, not just a mere observer. Moving ahead I will be refocusing my efforts from promoting cycling to a public that already understands its benefits, to making those benefits known to policy makers and people who are in a position to make a change. Through my research, observations, and almost 20 years of cycling the streets of Tokyo I have built a vast collection of knowledge about cycling and cyclists in this great city and wish to share this knowledge with people who can use it to make a difference and am always available for discussions or to make presentations on the topic. Please don't hesitate to contact me.